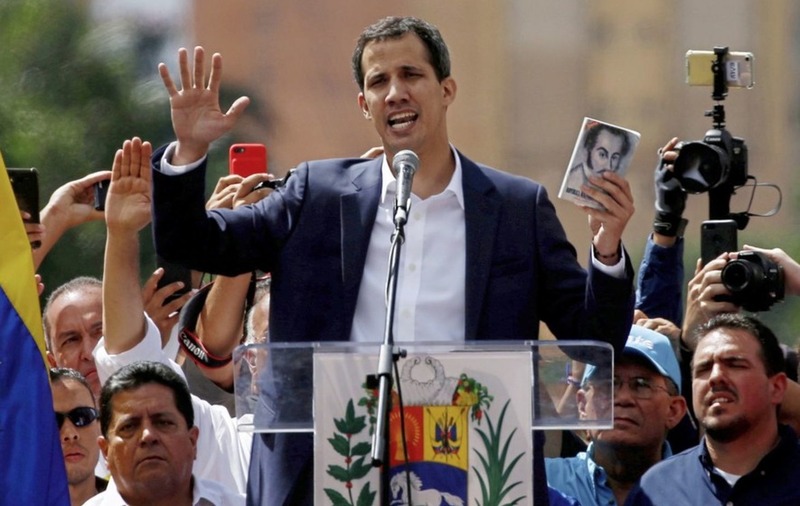 Venezuelan opposition leader Juan Guaido has called on the international community to consider "all options" to resolve the country's crisis, echoing comments from the Trump administration hinting at potential US military involvement. 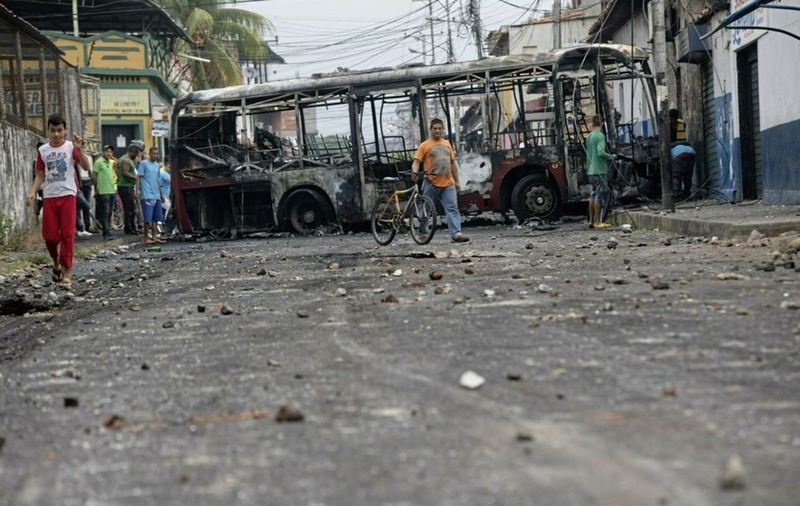 Mr Guaido's comments came after a tumultuous weekend that saw President Nicolas Maduro's forces fire tear gas and buckshot on activists trying to deliver humanitarian aid in violent clashes that left two people dead and some 300 injured. For weeks, the US and regional allies had been amassing emergency food and medical kits on Venezuela's borders in anticipation of carrying out a "humanitarian avalanche" by land and sea to undermine Mr Maduro's rule. With activists failing to penetrate government blockades and deliver the aid, Mr Guaido announced that he would escalate his appeal to the international community – beginning with a meeting on Monday in Colombia's capital with US vice-president Mike Pence on the sidelines of an emergency summit of leaders of the so-called Lima Group to discuss Venezuela's crisis. He said he would urge the international community to keep "all options open" in the fight to restore Venezuela's democracy, using identical language to that of US president Donald Trump, who in his public statements has repeatedly refused to rule out force and reportedly even secretly pressed aides as early as 2017 about the possibility of a military incursion. 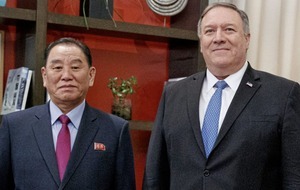 US secretary of state Mike Pompeo has also stepped up the belligerent rhetoric, saying on CNN's State Of The Union on Sunday that Mr Maduro's "days are numbered". Republican senator Marco Rubio of Florida, who visited the border last week and has Mr Trump's ear on policy toward Venezuela, tweeted out pictures of anti-American strongmen including Panama's Manuel Noriega, Libya's Muammar Gaddafi and Romania's Nicolae Ceausescu at the height of their power and then tragic downfall – the not so subtle suggestion being that Mr Maduro himself could suffer a similar fate. A close Guaido ally, Julio Borges, the exiled leader of congress who is Mr Guaido's ambassador to the Lima Group, was even more explicit in urging a military option. 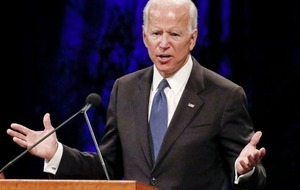 "We are going to demand an escalation of diplomatic pressure... and the use of force against Nicolas Maduro's dictatorship," he said on Sunday. It is a prospect that analysts warn risks fracturing a hard-won coalition of Latin American nations who have come together to pressure Mr Maduro's socialist government. Most Latin American governments, even conservative ones like those in neighbouring Colombia and Brazil, are on the record opposing a military solution and would face huge dissent should they back any military action led by the US, whose interventions in the region during the Cold War remain an open wound. 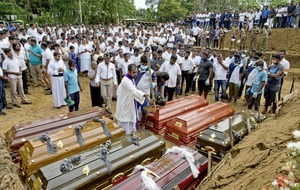 "These governments know they would face a huge tide of internal opinion greatly offended by a US-led invasion for historical and political reasons," said Ivan Briscoe, the Latin America director for the Crisis Group, a Belgium-based think tank. Senator Chris Murphy of Connecticut, a senior Democrat on the Senate Foreign Relations Committee, over the weekend warned about a "potential trap being set by Trump". "Cheering humanitarian convoys sounds like the right thing to do, but what if it's not about the aid? What if the real agenda is laying a pretext for war?" Mr Murphy said on Twitter. At the same time, though polls say Venezuelans overwhelmingly want Mr Maduro to resign, almost an equal number reject the possibility of a foreign invasion to resolve the political impasse.